I hope you had a lovely weekend whether it was long or not so long. We got a couple of inches of snow in DC this weekend, which in my opinion was a reward for putting up with frigid temps all weekend! And its supposed to be 60 this weekend. While the weather may wacky, let's keep it season specific with some wrap sweaters. 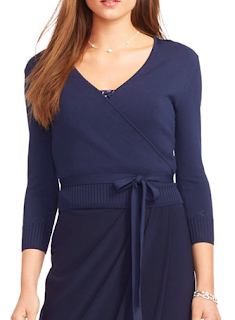 In the summer, we love wrap dresses, so why not carry the silhouette to winter in the form of a sweater? 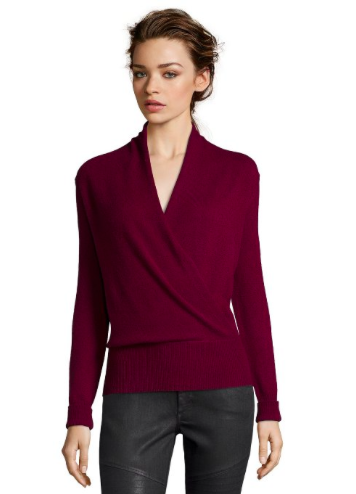 Supple cashmere in a rich merlot. Talk about a statement yet class neckline. $50 off right now. This is going to be a go to piece in your closet. A little ballerina-esque. 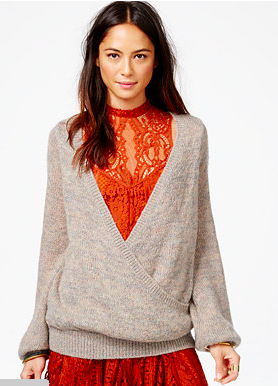 And speaking of feminine, this wrap cardi reminds me of something Zooey Deschanel would wear. Hello cozy comfort. I'm not too sure what's happening underneath but I love this heathered sweater. So it may be 10 degrees or 50 degrees, either way you can layer up and wrap up in a wrap sweater this winter.